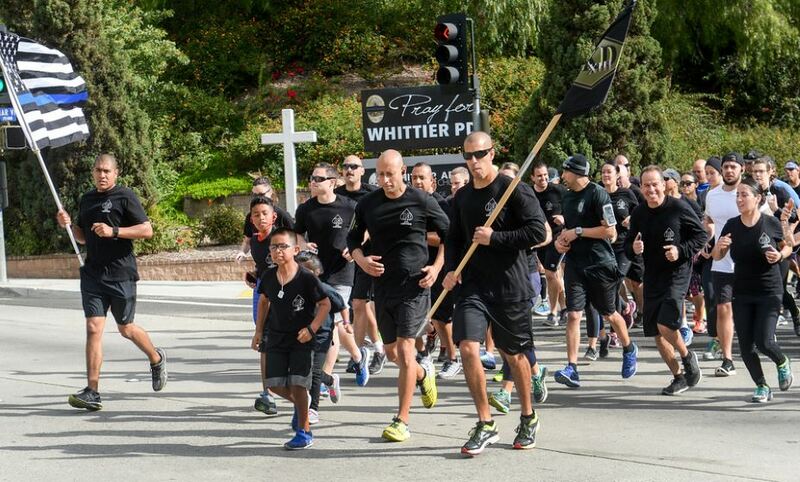 WHITTIER >> What was originally planned as a small training run in honor of slain Whittier police Officer Whittier Boyer swelled into a memorial run that attracted about 400 people who wanted to pay tribute to the fallen lawman in Whittier on Sunday. 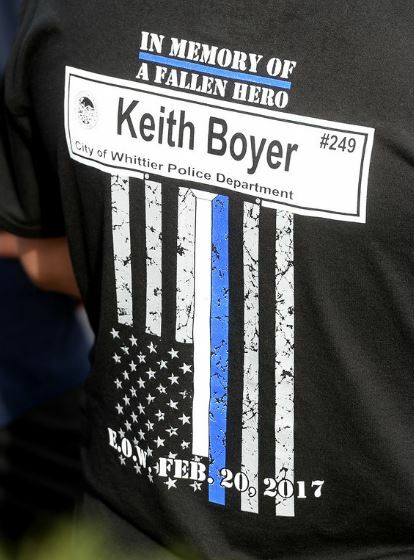 The run went from the Los Angeles County Sheriff’s Department’s STARS Center in Whittier to the scene of Boyer’s fatal Feb. 20 shooting at Colima Road and Mar Vista Avenue in Whittier. 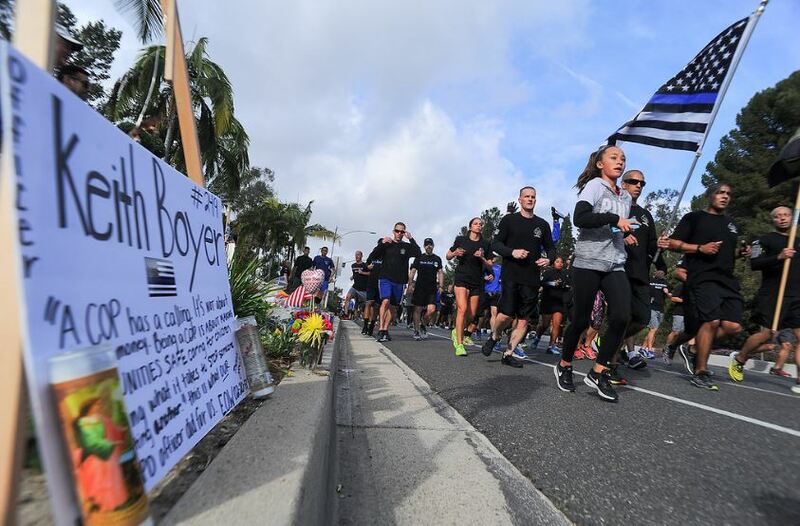 Law enforcement officers, cadets, Explorer Scouts and supporters of law enforcement from throughout Southern California laced up their running shoes to show their respect for Boyer’s service and sacrifice. It began as a training run intended for members of the Los Angeles County Sheriff’s Department’s Lakewood Station Baker to Vegas relay team, according to Deputy Jason Colon, who serves as the team’s captain. Before joining the sheriff’s department, Colon began his career as a Whittier police officer, where Officer Boyer served as one of his training officers. “It was honestly going to start out as a training run for our team,” he said. But the word of the planned run in honor of Boyer spread like wildfire, throughout Los Angeles County and beyond, he said. Representatives from agencies throughout Los Angeles and Orange counties ultimately turned up in tribute to Boyer. “Everyone was paying their respects and running in his honor,” Colon said. Community members waived in support of the runners from the roadside. Once the group reached the shooting site, they paused for a moment of silence and a prayer. Runners also took up a collection to add to the fund benefitting Boyer’s family. WEST COVINA >> Police in West Covina are marking the anniversary of the death of a 29-year-old fellow officer who was killed in a shootout with an escaped psychiatric patient 38 years ago. 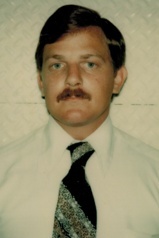 West Covina police Officer Jay Warren Jackson made the ultimate sacrifice in the line of duty on Jan. 14, 1978, West Covina police spokesman Rudy Lopez said. Officers will be wearing black bands over their badges in his honor throughout the day. 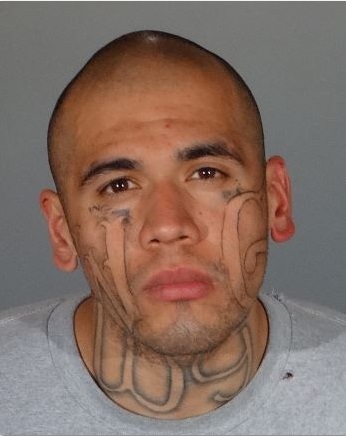 The officer had been in pursuit of a fleeing car down the eastbound 10 Freeway when the suspect exited at Holt Avenue and spun out, officials said. The driver jumped out of his car and hid behind as police approached. 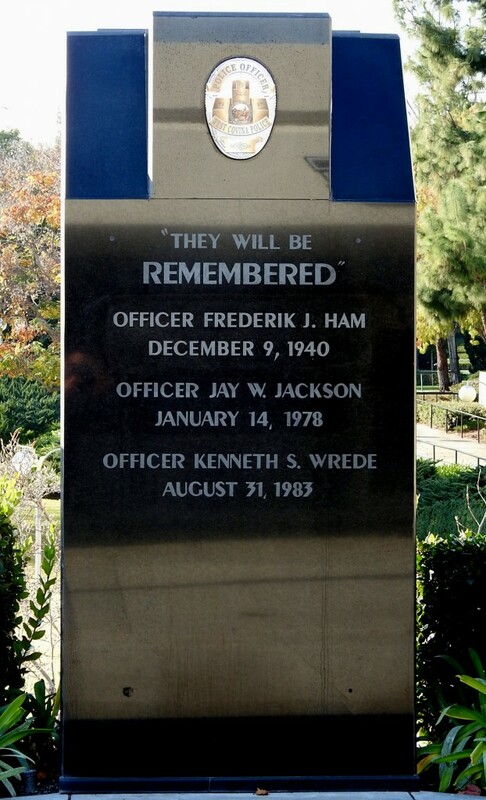 Jackson’s name is one of three emblazoned on the West Covina Police Memorial, honoring police officers who died while serving West Covina. 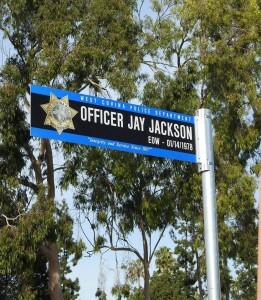 And like the other two fallen West Covina officers, a street sign marks the location of his slaying. 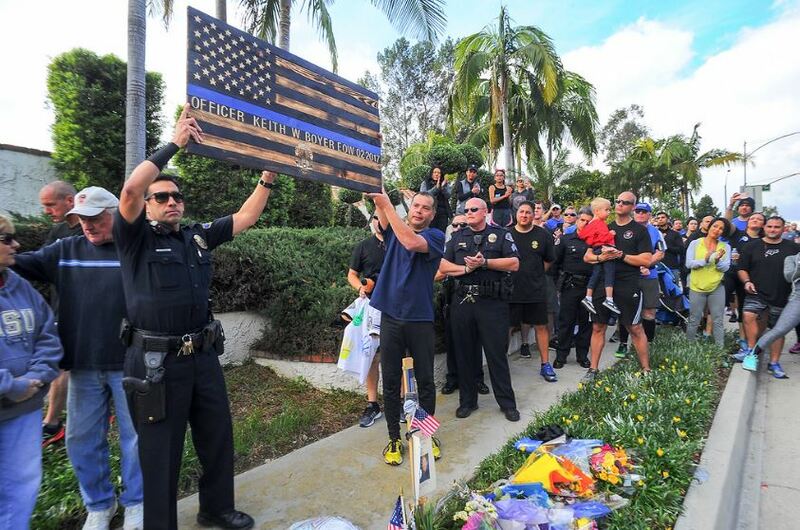 Fellow officers shot and killed the suspect, who it was later learned had fled from a psychiatric facility and made threats of suicide to family and friends, according to Lopez. Born in Pasadena on Nov. 7, 1948, Jackson was raised in West Covina. He joined the U.S. Army in 1968 and received an honorable discharge with the rank of sergeant four years later. He married his wife, Patricia, in 1971 and the couple a daughter, Shauna, in 1973. Jackson began his career with the Azusa Police Department in 1973, graduating the Rio Hondo Police Academy the following year. He joined the West Covina Police Department as a patrol officer in 1977. In addition to his wife and daughter, Jackson is survived by his mother, Cora Jackson, and two sisters. 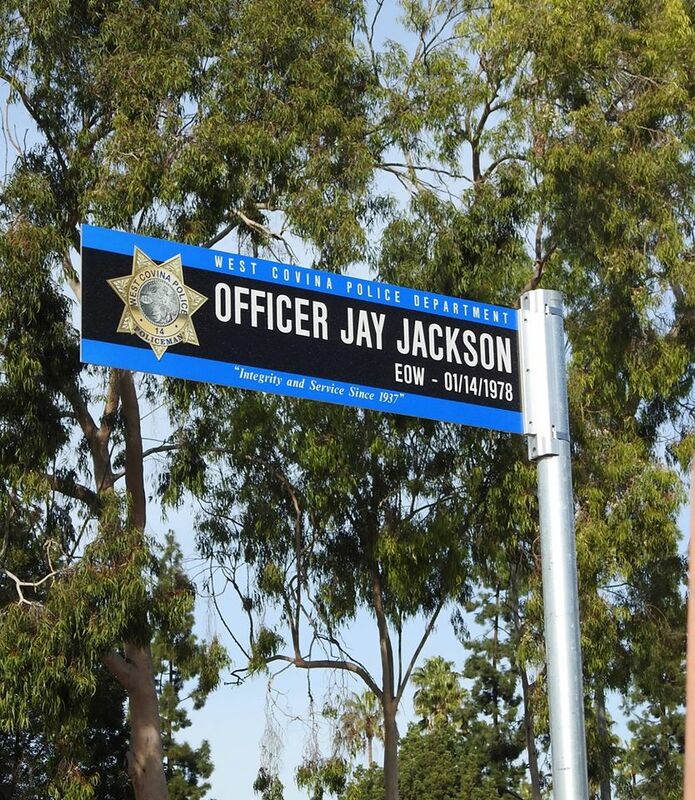 PHOTOS of fallen Officer Jay Warren Jackson, street sign, West Covina Police Memorial Courtesy of the West Covina Police Department.